Then in the afternoon it was down to SE to meet Mr. Raving Bike Fiend. Today’s mission: figure out what was up with my Sturmey-Archer AW 3 speed hub on the Raleigh Wayfarer and to also diagnose the pedal/crankarm issue. 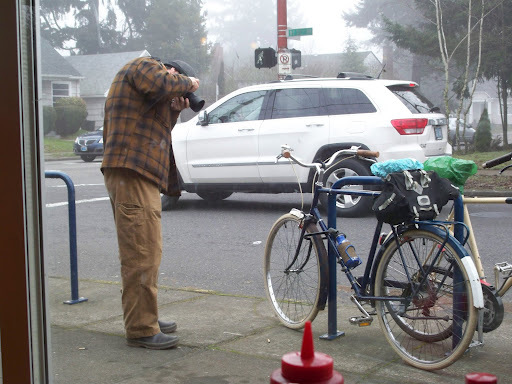 We met up at A Better Cycle on SE Division and 23rd. TimTim, (one of) the shop’s proprietors, upon hearing that Keith RBF was from Edmonton, asked if he played bike polo. 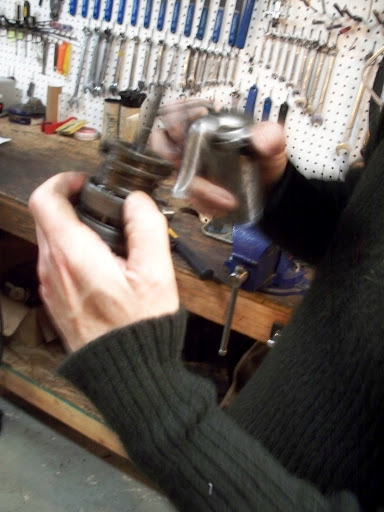 “No,” replied Keith, “I just work on their bikes.” Timtim gave Keith a tour of the facilities, and let him use the vise in order to make the opening of the AW hub easier. 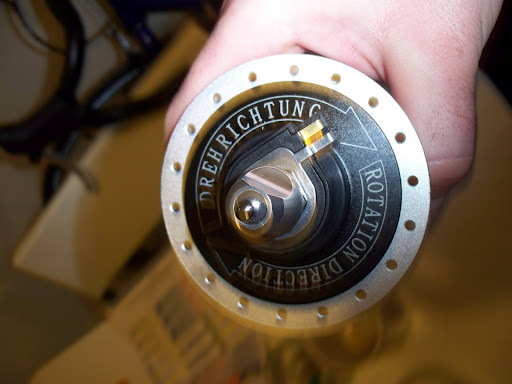 After opening the hub, Keith found out what was wrong: the “sun” gear* had come loose because the pin holding it had broken. 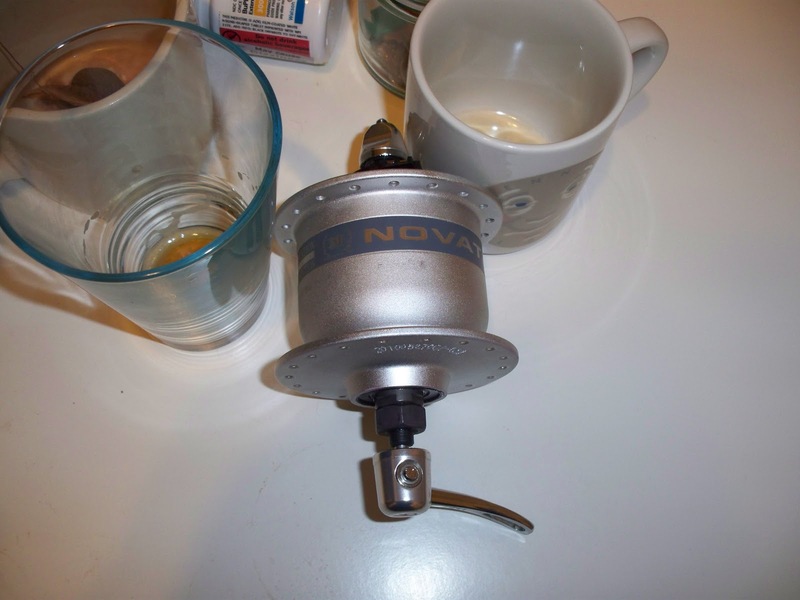 Knowing that finding the pin might be tough, he found a used AW hub from 1954 that was in fine working condition. So he simply took the internals of this hub and put it into my wheel. So I replaced a 1956 hub…with a 1954 hub! (Great that AW hubs are so interchangeable!) And the cost? Ten bucks! The problem with my pedals and cranks was a “bad” cotter pin. So Keith removed both cotters and replaced them. Now I have three speeds on my bike again! And smooth pedal action! After a celebratory burrito stop at Los Gorditos, Keith went back to The Girl and I made a swing by Clever Cycles to do a little window shopping (and bag ordering) before they closed. Then it was 6:30pm so time to go to Sizzle Pie on E. Burnside for the Cycle Wild work meeting. We had about 14 people, and we talked about possible locations for day rides to nature spots. Matt compiled quite a good list of destinations, so it will be exciting to see all the rides that do happen! The work part didn’t last long, so time for beer and pizza. The ride back home was a lot easier now that I had all my gears! Oh yeah, at the Cycle Wild meeting I bought a dynohub from Ed! It’s a Novatech that is sold by Velo-Orange. Reviews I have seen have been “o-k”, more drag then Shimano and Schmidt. But it was cheap ($35) and is going to go on the Raleigh, so drag isn’t as much of an issue, the issue is “getting it done”. 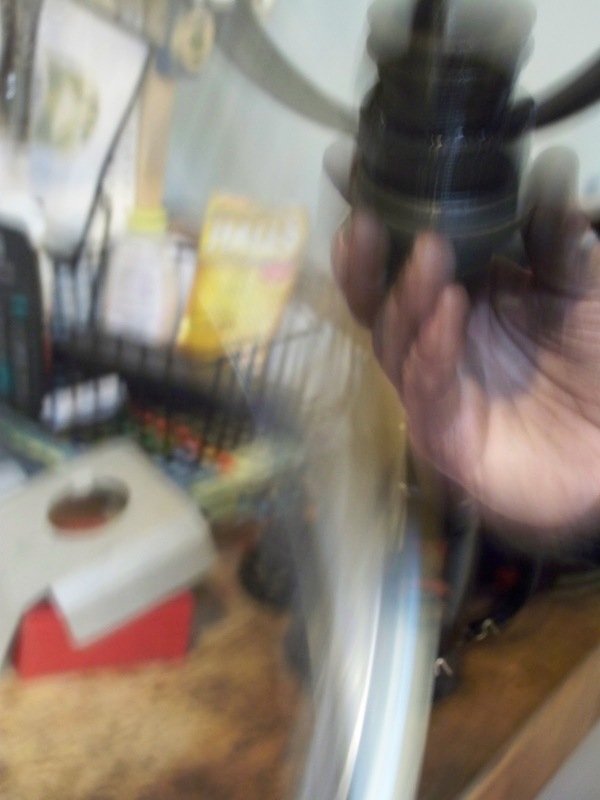 Now I just need to pick up my CR18 rim and spokes from North Portland Bikeworks** and Keith will build a wheel! Exciting! *Not going to go into detail about how a internal gear hub, aka, “planetary” hub works. You’ll just have to consult Sheldon Brown here, here, and here. **Sheesh, enough bike shops, eh? We also managed to stop at Citybikes as well. Will have to say that A Better Cycle rates as my favourite bike shop stops on this trip to Portland and they made me feel right at home.They are what I believe a bike shop should be.. friendly,knowledgeable, accommodating, and owner operated to boot ! Well Keith, it doesn't hurt to have some good help on this bike!